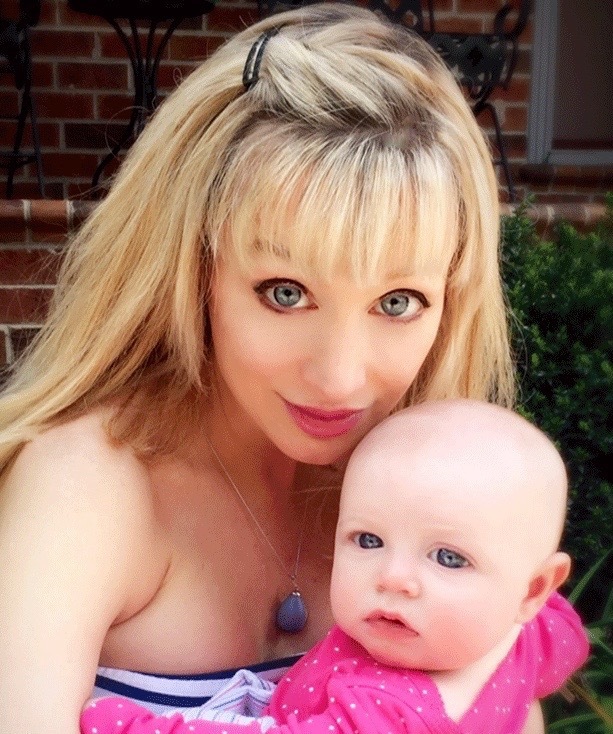 I’ve struggled with my eyebrows for decades, DECADES! My God-given brows are very dark brown and full. 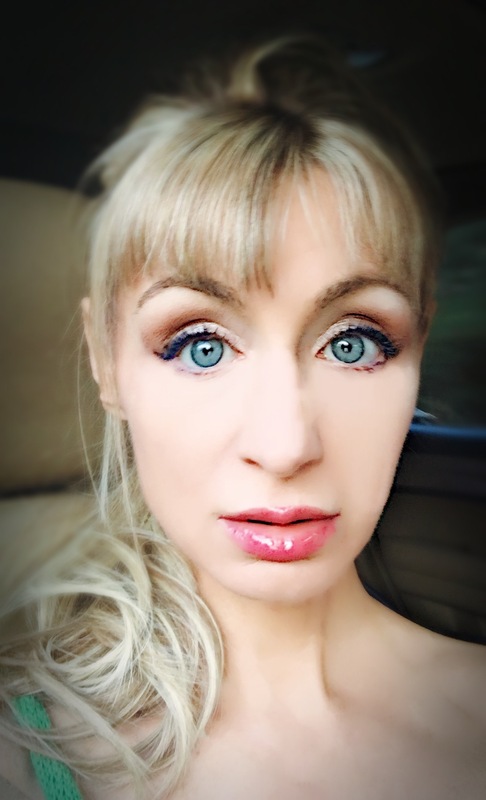 In my early 20s I went blond and decided those dark brown brows were way too harsh. But instead of doing the wise thing (i.e. tinting them a lighter shade), I plucked them until they were nearly invisible. Hey, thin brows were the thing in the late 1990s / early 2000s. Still, when I look back at pics of myself from those years, I shudder. My whole face looks weird. 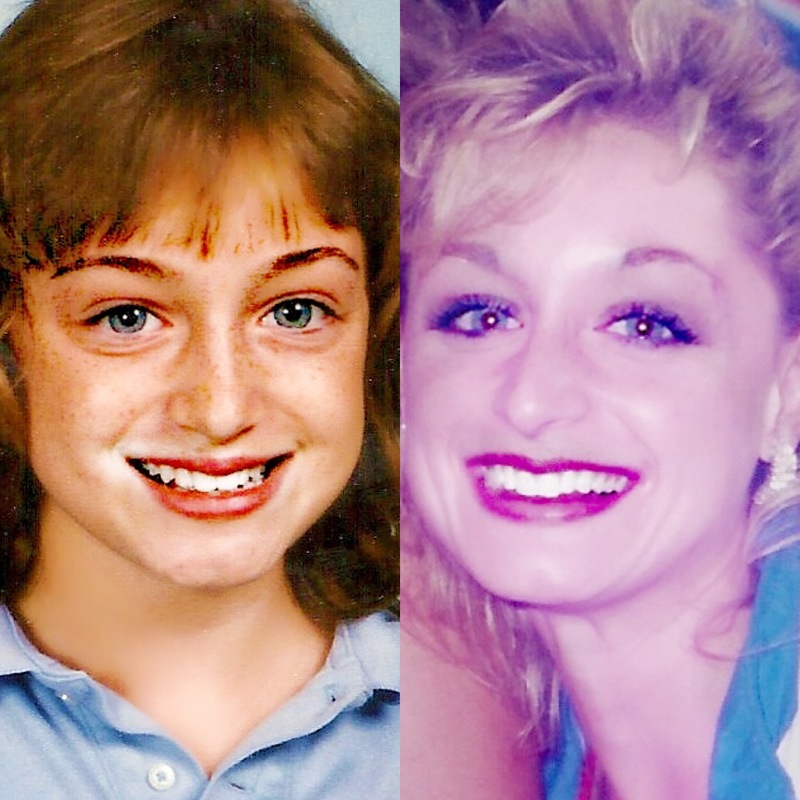 On the left, 11 years old with natural (untouched) hair and brows; At right, 20 years old with big blond hair and barely-there brows. When I finally put down the tweezers, my brows did grow back, albeit less full and with a few holes. But I found myself completely unsure about how to style them. I spent hours browsing (pun intended) IG pics and video tutorials for #Instagrambrows, #browsonfleek, #browsheldhigh, and so on. I bought tons of brow products – gels, powders, pencils, combs, spoolies, brushes, etc. Finally I decided I needed some sort of guide. I found this video from Angie of Hot & Flashy.com. In this video Angie demos and highly recommends an all-in-brow kit from Too Faced. The kit retails for $39 and contains 3 stencils, 2 “universal” brow powders, a wax, one pair of tweezers, a mini slanted brush and a mini spoolie brush. So, I started thinking, I already have most of those products. What I need is stencils! After searching for several weeks I found these at one of the Wal-marts in our area, but I’d probably checked 3 or 4 before finding them. 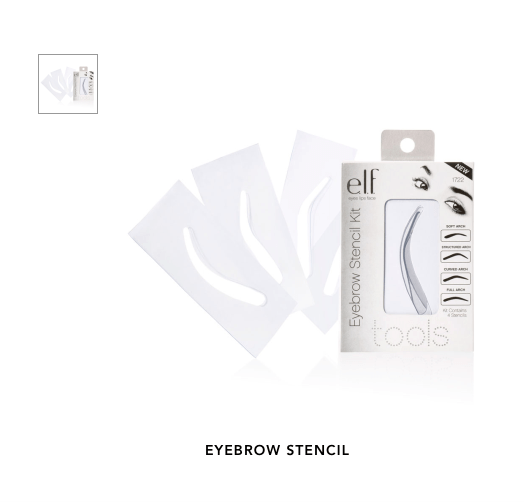 E.L.F.’s Essential Eyebrow Stencils are one of the best, most cost-efficient beauty purchases I’ve made in years. They’re incredibly easy to use; easy to clean; and (as I’ll explain) offer options for just about everyone. Since I began using these stencils a couple weeks ago, I received multiple compliments on my brows. The first compliments my brows have received since…well, since I went blond. Special Features: A few aspects of this bargain-priced kit are special – The individual stencils are divided by a white piece of paper which has a cutout of the brow shape on the stencil behind it. That helps brow novices know for sure which stencil they’re looking at – i.e., “is this a structured or the full arch?” You can also hold the papers up to your own brows to try out the looks before committing to one of the stencils. When you select one of the stencils, you’ll find that the brow shapes are stamped onto the square silicone stencils but the brow shapes are not “punched” out. That means, if holding paper up to your brows didn’t help you select a stencil, you can pop out the individual shapes brow shapes and place each one over your own brows to determine which one/ones suit you best. You can also use those pop-out shapes to guide you in removing errant hairs outside your preferred shapes, especially helpful if you’re like me and tend to be tweezer-happy. Lastly, these stencils are very flexible. They mold to the shape of your face and stretch slightly (but not overly so) to accommodate longer brows. That may seem like a small thing but some brow stencils are hard and inflexible which is strange because faces are not flat and because brows vary in length. The thin material of E.L.F.’s stencils warms to your skin’s temperature, allowing it to better adheres to your eye area, and making it much easier to hold the stencil in place with one hand. And that allows you an easier, quicker and more precise brow application every time! Where to Buy: I found it at Wal-mart on the E.L.F. display. The selections vary store to store so you may have to check different Wal-marts if you can. Some drugstores, like CVS, also carry limited selections from the E.L.F. product lines. The only guaranteed way to purchase this or any E.L.F. product is from E.L.F.’s website. Shipping costs vary by location (E.L.F. offers free shipping to all USA sites for all orders of $25 and up). See full product info here. Summary: If you are brow-challenged or are a makeup beginner, this E.L.F. Essentials Eyebrow Stencil Kit is definitely worth the small investment! This entry was posted in Beauty Bargains, Makeup Tools and tagged #bblogger, #beautybargains, #BEAUTYPRODUCTREVIEWS, #beautytools, #brows, #ELF, #makeup, #makeupreviews, #makeuptools, #ROTD.